We are pleased to announce the joint international multidisciplinary workshop MURPHYS-HSFS-2014. The workshop will take place at the Weierstrass Institute (WIAS) in Berlin, Germany, April 7-11, 2014. The workshop will be devoted to mathematical theory and applications of systems with hysteresis and multiple scale systems. 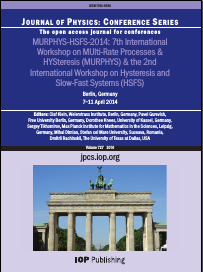 MURPHYS (Multi-Rate Processes and Hysteresis) is the 7th workshop that continues a series of biennial conferences. MURPHYS focuses on multiple scale, singular perturbation, phase transition and hysteresis phenomena occurring in mathematical, physical, economical, engineering and information systems. HSFS (Hysteresis and Slow-Fast Systems) is the follow-up of a workshop organized in the framework of the Collaborative Research Center 910 (Berlin). HSFS focuses on reaction-diffusion equations with hysteresis, systems with different temporal and spatial scales, and applications to self-organizing nonlinear systems. We look forward to meeting you in Berlin. Address: WIAS, Dr. Olaf Klein, Mohrenstrasse 39, 10117 Berlin, Germany.